A heart full of music. I have two concert subscriptions at Carnegie Hall. This fact is evidence of a tendency to overindulge, a tendency to want to be a patron of the arts even with my meager budget, a tendency to not be able to choose between two good things. Tonight was the Philadelphia Orchestra, the second of the two subscriptions I’ve been buying the last few years. My friend and I have box seats in the second tier. Box seats are very fancy, to say the least. Mostly for me the seat represents not having to squeeze into auditorium seats, not having to get up every time someone wants in or out of the row. Having my own freestanding chair is a luxury I am willing to afford. It makes being comfortable for the whole performance possible. Also, it’s totally fancy. Natch. It’s also unexpectedly familial. It hadn’t occurred to me that I’d see some of the same people show after show, that there would be other repeat subscribers just as my friend and I are repeaters. Three of the seats in our box are not subscription seats, and we see different folks in those chairs every time. The other four box members are regulars, they’ve been there longer than we have. And the gentleman who sits in front of me has adopted us. When I walked in tonight — only moments before the show began! — he gave me such a nice welcome, like i was an old friend or a favorite niece. I was charmed and pleased. I love this orchestra. They always make me happy. I love their tiny dynamo of a conductor, Yannick Nézet-Séguin. He is a powerhouse, an explosion of passion, enthusiasm, intensity, and joy. If I expended the kind of energy he does every performance, I would need three days’ sleep after every show. Nézet-Séguin clearly loves his players as much as he totally loves the music. His obvious pleasure in their excellent performances is lovely to watch. And the musicians respond so wonderfully to him. I love spotting the little moments when one will catch his eye during a performance. I can almost see the electrical connection flash between them. I had to miss the first concert of this season’s subscription because I was traveling for work. So tonight was my first show of the season. As usual, it filled me up with wonder and joy. Having these subscriptions is an indulgence. An indulgence that feeds my soul. Worth every penny. Today is my wonderful niece’s birthday. Because she’s an April baby, I’ve been writing birthday poems for her for several years now. I thought I might have trouble doing that this year — how would I find something in the news that would let me ramble on about how fab my delightful god-daughter is? Well, thanks to Jezebel and Cardi B, I was able to set my worry aside. This poem would need some beyond-the-source-text words to do the things I wanted it to do, but I’m still pleased that I was able to make it work, able to extend my streak of niece poems one more year. as a means of ascension. a testament to her currency. Out like a … ram. It’s the 31st of March, birthday of my wonderful Aries sister, Fox (Aries, the ram, hence this post’s title). She is my best-beloved, baby sister, my forever best friend, my voice-of-reason sounding board, and my cheering section. I have known her for her whole life and all but a short five and a half years of mine. We don’t live close, which is still hard for me despite the fact that it’s been true for more than 20 years. She is always a call, email, or text away, but it’s not the same as having her in the next room. Not the same as meeting her early-early on Saturday mornings for a long walk in Prospect Park. Not the same as going with her to parties and concerts. Alas. But we’re together for this weekend, and that’s all the way fantastic! We have laughed and shared stories and silliness, and we have a whole other day together tomorrow. So happy birthday to one of my most favorite people in the multiverse!! It’s the final day of the 11th annual Slice of Life Story Challenge over at Two Writing Teachers! 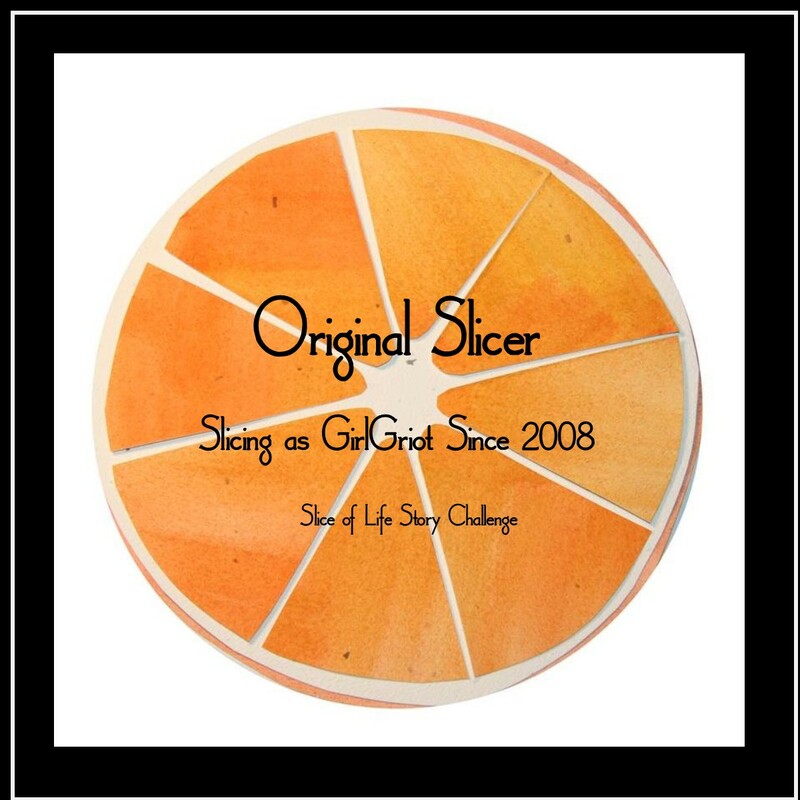 As the badge below proclaims, I am an original slicer. This challenge and my blog started the same year. My first blog post was January 28, 2008, and somehow I found Two Writing Teachers in time to sign on for Slice of Life only a few weeks later. And for all the time I don’t spend posting here during the year, I always come back for March. Always. Hope to see the slicing community grow even larger next year!